All is set this morning at Boma Grounds in Butalejja District for the celebration of the 37th anniversary of the beginning of the war that brought the NRM government to power. This year’s event will also mark the first East African Community Armed forces week celebrations. Military contingents from five East African countries comprising of medics and engineers last week started arriving in Uganda to take part in civil military activities that always preceed Tarehe Sita. 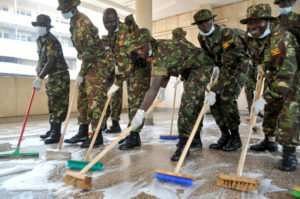 Each country – South Sudan, Tanzania, Kenya, Rwanda and Burundi sent a contingent of 15-30 officers to offer a series of medical services and repairing broken facilities at health (facilities) in Bukedi sub-region in eastern Uganda. Bukedi sub-region is composed of Butaleja, Budaka, Busia, Pallisa, Kibuku and Tororo. Since Wednesday last week, the Rwandan contingent was operating in Tororo, Burundian in Kibuku, South Sudanese in Busia, Kenyan in Pallisa and Tanzanian in Budaka districts. Uganda is the first in the region to host the armed forces week. The EAC secretariat, a few years ago, resolved that the region’s armed forces hold the week-long civil military activities annually in different countries in the region on a rotational basis. According to a statement issued by the UPDF Spokesman Brig. Richard Karemire, this year’s theme is “Reaffirming the Contribution of the Armed Forces towards Regional Integration for our Strategic Security, Development and Prosperity”.